Rhododendron tuba is a tropical Vireya type rhododendron that has its origins in New Guinea. It is the hybrids of Rhododendron tuba that are widely grown, and this Vireya type and typifies the variety. 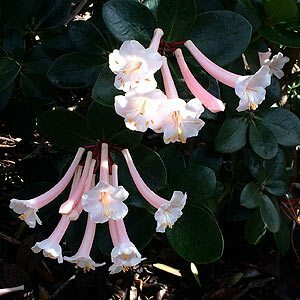 With long tubular flowers, as the name suggests, the species does differ however this is a pink flowering type with white flared flowers. Although seen as ‘tropical types’ as they come from these areas they are suited to grow in temperate climates. They naturally grow in the cooler mountainous regions so are well suited to temperate climates.